Towson University: One in 22,449. | the writings of sylvia a. The alarm clock goes off. It is 5:55 a.m. He puts it to snooze for another few minutes. The birds start to chirp outside and the sun hasn’t risen yet. The second alarm goes off and he’s up to start his day at 6 a.m. With his usual breakfast consisting of grits, a piece of toast, and a cup of coffee in the morning, he is ready to start his day just like any other day. Drew Cheripko, a 23-year-old Towson University student majoring in criminal justice has to balance not only his academic life, but his athletic life as well. Cheripko lives a life not exactly like any other regular college student, even during the summer. 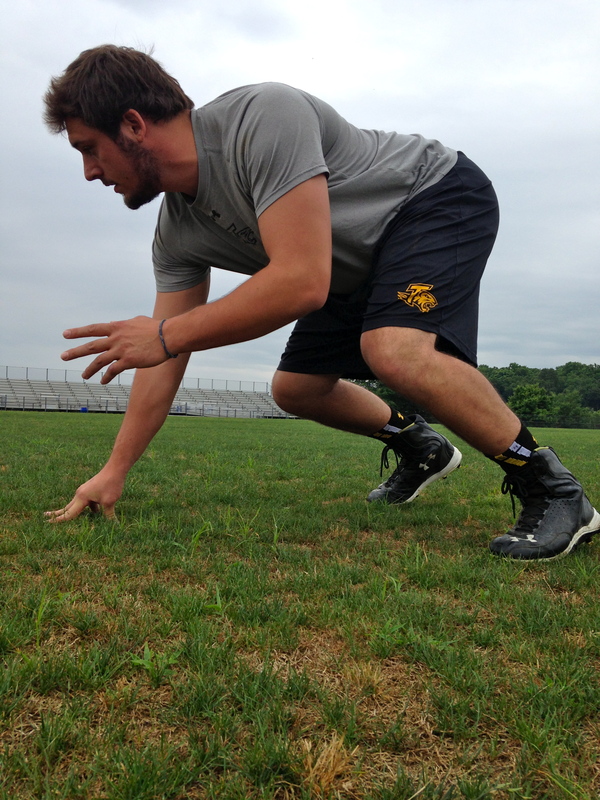 As a fifth year red shirt senior on the Towson University football team, summer is the best time to train for the upcoming season. As most college students see summer as a time to go on vacation, relax, get an internship, or have a summer job; this Towson University student-athlete may have a different routine than a normal Towson University student. After playing and having lost to North Dakota State University on January 4,, 2014 at the FCS National Championship title in Frisco, TX; the Towson University football team is off to better themselves, Cheripko says. Not only was playing at the FCS Championship for the first time an experience for the team, the Towson University football team experienced an overall change to improve its record and players with its new-found dedication. “I’ve seen the program go from a 1-10 to a 13-3, so it means hard work to me,” Cheripko stated. During the summer, Cheripko trains with the rest of the football team on Mondays, Tuesdays, Thursdays, and Fridays, including morning workouts, practices, and ending each of those days with evening runs. Not only is he training with these workouts every week, but he manages to take two online summer courses and works for his Uncle during the summer to keep him focused and busy. Four out of seven days, he is busy with team workouts, but this doesn’t stop him individually. Cheripko is dedicated for his love of football because on his off days, he goes back to Northwest High School in Germantown, MD to keep on training, working on technique, and working out individually. During the fall is when he intensely trains every Sunday, Tuesday, Wednesday, Thursday, and Friday including a game every Saturday. He wakes up to go to his morning practices, prepares for class quickly after, attends study hall and then goes to his evening workouts until the late hours. Just like any other student-athlete, having to manage your time is important. “It keeps you busy and it keeps you active,” Cheripko says. Christopher Bisselle, a roommate and former teammate of Cheripko has played right next to him on the field to seeing him tackle the opposing team at Unitas Stadium. Towson University has helped Cheripko find the opportunity to better himself as he works out on his own and doesn’t want to lose his position on the team. He hopes to get a good job after he graduates, or if he’s lucky enough to go to the next level playing football. “My dream would be to keep on playing football at the next level, so my dream at a more realistic one is to get a good job,” Cheripko states with a smile. Studying at Towson University and being on the Towson University football team has helped Cheripko realistically pursue to obtain his criminal justice degree and learn to overcome different obstacles of his life. Pingback: Hard Work Pays Off | the writings of sylvia a.